This past December just marked three years that this little blog of mine has been around so I thought it would be fun to have a giveaway! The beginning of 2012 brought a sweeping round of sniffles and coughs our way. It is difficult to avoid all illness with a large family and especially with children in school where they are exposed more readily. I think prevention is key to surviving the cold and flu season! We feed our bodies well, get plenty of rest, wash our hands diligently and take vitamins. Even though we keep our immune systems in check, sometimes the germs do find their way in. Our family does not use any over-the-counter medications but we find that good old-fashioned, natural remedies help us to recover quickly and without unnecessary trips to the doctor's office. as a powerful "Stay Well" gift this Winter! *Seventh Generation hand wash in Fresh Citrus! Not only is this hand wash free of triclosan, dyes and synthetic fragrances but the citrus scent will lift your spirits from those Winter blahs! *A Tea Sampler from Traditional Medicinals (Gypsy Cold Care, Organic Echinacea Plus, Organic Throat Care and Breathe Easy). These teas are great and the kids can drink them to soothe sore throats and coughs because they are caffeine free! 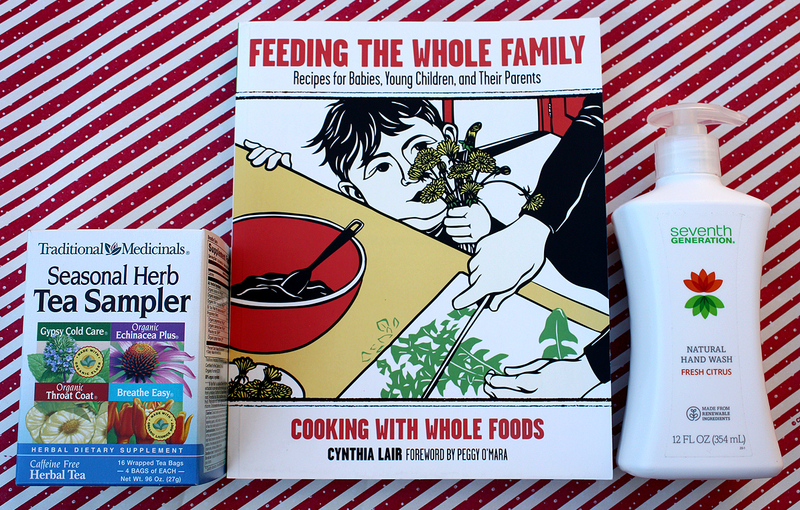 *Feeding the Whole Family: Cooking With Whole Foods by Cynthia Lair. I have a copy of this book myself and have not even begun to skim the surface of the recipes in here! As I wrote about before, we eat as a family unit at meals (I am NOT a short order cook!). We want to raise healthy eaters and I find that this book provides a lot of great information as well as easy recipes that the whole family (even our littlest Evangeline) can enjoy together. Would you like to win this little Winter package of goodness? * Giveaway will end next Thursday, January 19th, midnight EST. * Winner will be announced Friday, January 20th, 2012. Hi there, I love that blog of yours. I only have two little ones (1 and 2 yrs old) and find it very inspiring how you handle your huge family. My best zwo tips for staying healthy in winter: Vitamin d supplement. And heaps of fresh fruits. I would love to win your winterpackage! Oh, I would like to win!! My tips for staying healthy are simple- wash hands, get our rest, eat well. :) I have a pair of 1 year olds and a 3 year old, so staying healthy is very important! Let's see. Besides staying totally away from anyone else on the planet except my husband, I would say hand washing and watching what I touch when I'm out and about is one of the best ways to avoid any nasty, nasty cold/flu bugs. I have cornered the market on alcohol based gel hand sanitizer and my hands have turned into prunes, but SO FAR I've avoided the nasty bugs. Love your blog BTW! We take a lot of vitamin c and echinacea. It seems to do the trick..
We stay healthy by eating good food, getting enough rest, and moving our bodies regularly. A daily multi-vitamin, washing hands regularly and exercising. Just came across your blog and I think I will be adding it to my list. For the winter seasons I try to make an elderberry syrup for its antiviral properties. It seems to do a pretty good job. My best tip for staying healthy is to get enough sleep - I know I seem to need more in the winter than I do in the summer. We make a fresh ginger tea with cinnamon sticks. It can get very spicy for little ones so I don't let it steep too long. Also humidifiers, they seen to shorten any cold or cough.